The land now occupied by the golf club was originally part of Westgate Farm. The land was first sold for building purposes but by the 1890’s there had been a slow- down in building and the land stood idle. The owners, Coutt’s Bank, did not want the land to become overgrown and unkempt; therefore the land was leased for the use by the Westgate-on-Sea Golf Association. 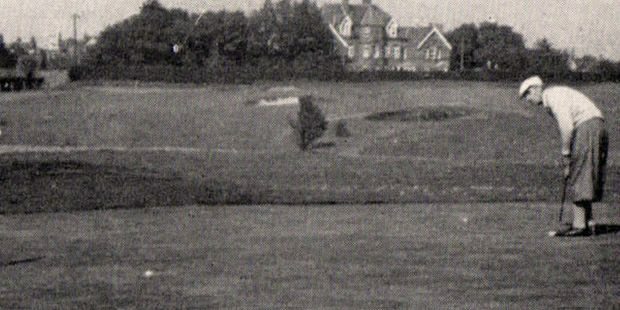 The newly laid-out 6 hole course was opened on Saturday 20th May 1893. Over time, the course extended to the other side of the railway line. By 1908 there were 9 holes. In 1913 a limited company was formed which took control of the course and remodelled it. By 1919, when the club came up for auction, it had 18 holes. It was purchased by Arthur Read. Arthur Read’s son, Ivor, succeeded his father and was Club Secretary for many years. The club house was opened in 1924. Up until the Second World War, it wasn’t just golf that was available; there were 22 tennis courts. Numerous tournaments were played on them, including the Isle of Thanet Championship. There have always been many golfing competitions and the club has many trophies. A large number of these trophies originated at the Hengrove Golf Club situated just south of Westgate, which closed during the Second World War. Many of their members then joined Westgate and Birchington Golf Club. The 1966 Official Club Handbook stated that the club has always recognised its role as part of a holiday resort and has sought to be a warm and friendly social centre; a policy that continues today.